Escondido’s Dashon “Fly Boy” Johnson, left, takes it on the chin from undefeated super middle weight Jesse Hart at the 2300 Arena in South Philly last month. Escondido’s very own Dashon “Fly Boy” Johnson flew into a buzzsaw before a jam-packed, standing room only crowd in the main event recently at the 2300 Arena in South Philly. North Philly’s super middleweight Jesse Hart, 20-0, 16 KOs, won a hard-fought ten round unanimous decision over the stubborn Johnson who also fights sometimes on the mixed martial arts circuit. Hart controlled much of the action, but Johnson gave him all he could handle, analysts said. The underdog took everything Hart threw at him, and came back with his own shots that had Hart hurt a few times during the second half. In the tenth, and final round, Johnson cut Hart over the left eye and dropped him to the mat with a trio of right-hand slams to the head. Hart got to his feet, and Johnson ran out of time to do more damage. It was a thrilling and dramatic fight that had the big crowd in a frenzy by the end. The three official scores all favored Hart, 98-91, 97-92 and 95-94. Johnson is 5-feet 7-inches, 145 pounds with a 70-inch reach. He was a carpet cleaner before entering the fight game in 2008 and going pro in 2012. 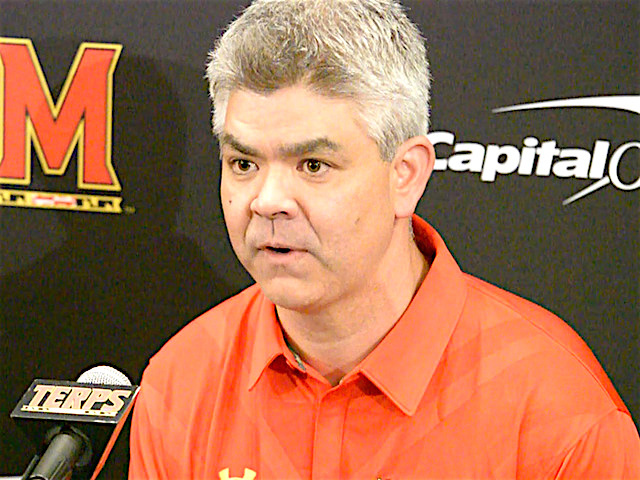 University of Maryland introduces new defensive coordinator Andy Buh on Tuesday. Local boy makes good defines Andy Buh’s new station in life. The Escondido native who played two seasons at linebacker for the Palomar College Comets before finishing his playing career at the University of Nevada in 1993-94, this week was named University of Maryland defensive coordinator by head coach DJ Durkin. Buh had been University of Kentucky outside linebackers coach last season and recently was promoted to special teams coordinator. Prior to that, he was defensive coordinator at Nevada, Cal and Stanford where he worked alongside Durkin in 2007. “There was only one phone call I made,” Durkin told reporters Tuesday. “There was only one person I spoke to about this job and that was it. I knew in my mind who we needed to go with and Andy is guy who is very familiar with what we do defensively. “He is a great coach on field, but really more than that, it’s just what he brings to the table in terms of off the field and the type of person he is and dealing with our players day-in and day-out,” Durkin said. Buh’s Kentucky defense rocked the SEC last season. The team allowed just 198.1 yards per game through the air, good for fifth in the SEC. Kentucky ranked fourth in the SEC and 14th nationally in red zone defense, and forced nine fumbles. The Cal State San Marcos team that captured its third Association of Independent Institutions (A.I.I.) Conference baseball crown in five years in 2015 before joining the NCAA Division II this year. Anybody with a mind to coach the California State University San Marcos Cougars baseball squad has got a shot. Applications should be turned in by April 29. The school, believe it or not, has a decade of intercollegiate competition under its belt while graduating to play this season in NCAA Division II. This year marked the inaugural season with the California Collegiate Athletic Association (CCAA), a highly competitive conference made up of the likes of UCSD, Cal Poly Pomona, San Francisco State and other Cal State schools. CSUSM associate director of athletics Todd Snedden leads the search committee. “The baseball coach, who will have the working title of head coach, will be responsible for the day-to-day operations of a successful NCAA Division II program,” Snedden said. “This includes, but is not limited to, recruiting, preparation and assistance with practice and competition scheduling, team travel organization, compliance with all NCAA rules, and student-athlete welfare. “The head coach will work with the academic support services staff in fostering academic success for all student-athletes, including graduation rates and retention of student-athletes,” Snedden said. Minimum requirements are a BA degree and two years of paid NCAA baseball coaching experience. Application questionnaires are available at http://www.csusm.edu/facultyopportunities/applicationforms.html. Snedden may be reached at athletics@csusm.edu. Be the first to comment on "Wide World of Sports: Fly Boy, Terps and CSUSM baseball coach in the news"